“In 2013 the owners of a large estate in the Bel-Air neighborhood of Los Angeles contacted us about a complete re-design of their entire landscape, saving only a few very old trees and slope covering shrubs around the property perimeter. 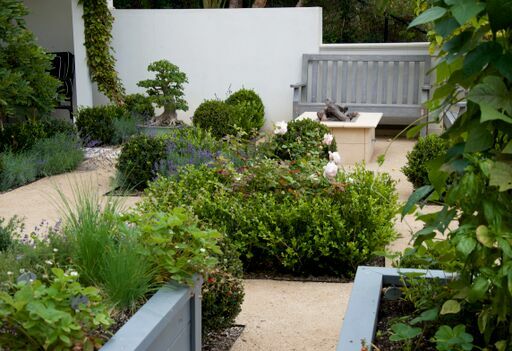 Part of the project involved converting a courtyard off the husband’s study into an edible and cutting garden with shaded seating areas. Two pergolas existed, but the rest of the courtyard was bare dirt. As the family is European, they wanted something that would remind them of their summers in France, so we designed and planted the courtyard with parterres of lavender and old world roses. ‘Versailles' style wood and steel band planters were built and planted with dwarf citrus trees and a section of four of them were turned into a raised vegetable and fruit garden planted generously by APLD member and edible expert Jacky Surber. Jacky has also maintained the garden over the last six years and ensures that the variety of edibles are thriving as the family enjoys a bountiful harvest year round. Photos courtesy of Katrina Coombs.